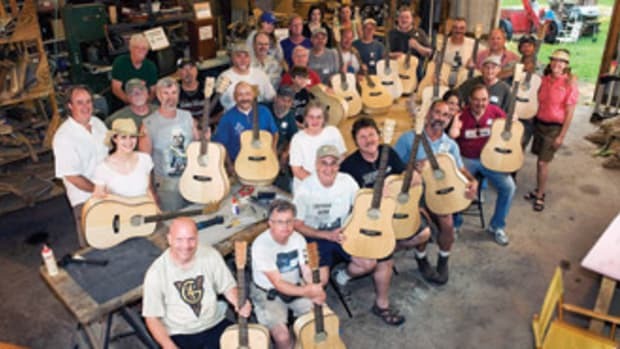 The Build a Vet a Guitar festival, which was held July 16-17 at the Wild Earth Woodworking School in Hudson, Wis., struck a chord with all participants. 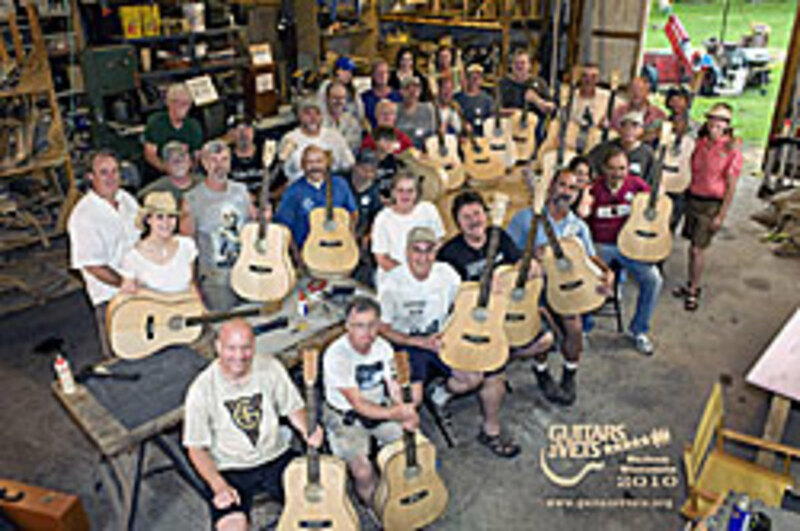 With the help of 80 volunteers, the group completed 20 guitars that will be given to deserving veterans. The festival was held to support the national reach of the unrelated Guitars for Vets, or GV4, program based in Milwaukee. George Vondriska, director of Wild Earth, worked out a plan in advance with G4V to put on the event in his hometown, which is about 30 minutes outside of the Twin Cities metro area. The Twin Cities had already been targeted by G4V as the next spot for a new chapter. The G4V program was started in 2007 by a Vietnam veteran and guitar instructor. The mission is to provide six free lessons and a new acoustic guitar to military veterans suffering from post-traumatic stress disorder at VA medical and community-based veterans centers. 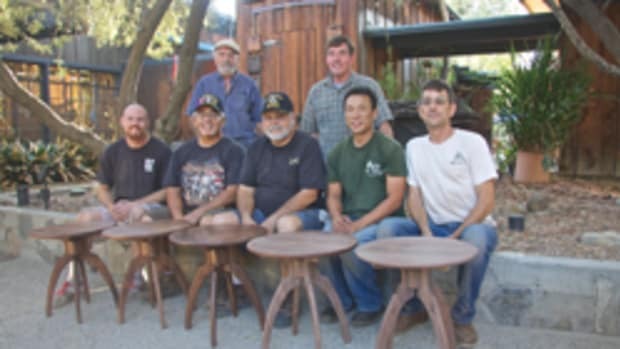 Vondriska, with the help of hired instructors, teaches various hands-on classes at the school including cabinetmaking, furniture making and lathe turning. About three years ago, he added a three-day guitar-making session to the curriculum. He says the G4V program inspired him to expand his guitar-making class to help their mission. "I built my first guitar in 2006 and have been teaching myself to play ever since. At some point, I was poking around on the Web looking for guitar-related stuff and stumbled across the G4V site. I immediately understood their tagline: "The healing power of music in the hands of heroes." I love to play my guitar, miss it if a few days go by when I don&apos;t get to play and could see how the instrument would help vets with [post-traumatic stress disorder]." Vondriska contacted Dan Van Buskirk and Patrick Nettesheim, the co-founders of G4V, and met with them last fall. In the process of throwing ideas at the wall, the founders indicated that a Twin Cities chapter was in the works and Vondriska proposed starting the chapter with a guitar build. "I had built a couple of the Grizzly steel string kits before and was pretty confident we could build 20 guitars in two days. We picked a date and I started working on logistics," says Vondriska. Guitar kits were ordered. Shellac was donated by Zinsser, sanding blocks and paper by Festool, sanding blocks by Time Shaver Tools, abrasive and masking tape by 3M, and the event was off and running. The Hudson Masonic Lodge handled all of the party planning, making sure there was plenty of food and drinks for the volunteers. A small group of woodworkers helped prepare before the event to do some preliminary work on the kits. "Our big goal was to have the necks glued on before the official start of the build. This is a little tricky and takes some finesse. All 20 necks were on by Wednesday afternoon, and we started problem-solving other &apos;finesse&apos; concerns for the build days. We had no idea how many, or how few, volunteers would show up, so we weren&apos;t sure what to expect," says Vondriska. As volunteers poured into the school on the first day, they were given an overview and were directed to a station. Each guitar moved through a production line. The group worked on fretboards and bridges on Friday afternoon, leaving details, finishing and setup for Saturday. Volunteers were spraying shellac by noon on the final day. "Many, many hands were involved in this. I couldn&apos;t have done this without above-and-beyond-the-call help from many people, donations to offset the costs involved and disposable materials supplied by manufacturers," says Vondriska. For information, visit www.aboutwildearth.com or www.guitarsforvets.org.